Chairman Michael Hogan said he wanted it stated and in the minutes that Dave Scalley was present at the meeting tonight as a Building Inspector/Code Enforcer. He also said that the secretary had received a resignation from Karen Saffian. He wanted to thank Karen for her time on the Planning Board. Chairman Hogan made a motion to: nominate Terry Penner to sit on the board for one year. Bonnie Moroney seconded and the vote passed unanimously.. Last month Terry Penner and Mike Finn had been nominated and voted to be alternates to the board. With Karen Saffian’s resignation, there was an open seat. Chair Hogan asked the board if anyone had any changes or corrections to the minutes of April 5, 2018. There were none. Bonnie Moroney made a motion to: approve the minutes of April 5, 2018 as written. Richard Krapf seconded and the motion passed with 5 ayes. Donna Foster was not at the last meeting so she abstained. The Chairman said they probably should have had her in for a consult first as it seems she isn’t sure what she is going to do. There appears to be a lot of questions as to what will actually be done. Fire Chief Oleson also said that the hand drawings were not going to be enough for this. She will have to get legitimate drawings done. And the fire department will have to be part of the changes made, especially for the new roads. Alessandro Foti asked if she was on town water and she said yes. He said she should also check to see if she changes the bed count in the cabins, her septic would be able to handle that. He also said that the Planning Board will require different things depending on what she does with her existing structures and campground. Bonnie Moroney asked if there was a survey map or Mylar? Michelle said no, there was nothing at the Registry of Deeds. She does have the septic maps but that is all. Bonnie said that was good but not the same thing. She told Michelle that before she moved any signs to check with DOT first. Dave Scalley said that in her best interest she should have a master plan for her property. That way she could phase out things as you do them. Dave said it would be good to get someone/company to do the plan’s for you with all the changes. Michael Hogan made a motion to: continue the application for Michelle Palys/Along the River Campground (formerly Tarry Ho Campground), Map 206 Lot 138/139, Route 302 W. Bonnie Moroney seconded and the motion passed unanimously. Michelle Pays also agreed to the continuation. Jon Warzocha, Horizons, agent for Carl Brooks, has asked the secretary for a continuance. The Board agreed to it. Don Bouchard, Horizons Engineering, said that the Omni Mount Washington Resort/Ski Area was ready to proceed with their application for a Site Plan for the gondola base terminal building and new towers, Map 211 Lot 14. At the March 1st Planning Board meeting the application was accepted as complete. 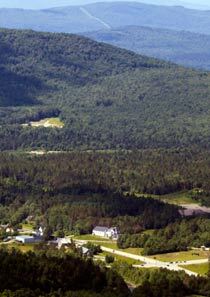 At the April 5th meeting, Horizons asked that the hearing be continued as Omni Mount Washington Resort was waiting for their meeting with the Bethlehem Planning Board. The Town of Bethlehem would have from the 4th tower and up and the new restaurant in their town. Chairman Hogan opened the public hearing. There was no one present to speak to it. The Chair closed the public hearing. •	They went before the Bethlehem Planning Board on April 18th and received approval for the application for the gondola towers and a new restaurant. They had previously been in March for a consultation. •	On the plans handed in to the Carroll Planning Board, there were two catch basins shown and they have added a third catch basin shown on pg. C3.01. •	Each gondola will carry 8 people with ski holders on the outside of the gondola cabin. There are 36 gondola cabins in all. Chairman Hogan said that several of the Carroll Planning Board members were at the Bethlehem meeting. Alex asked if the gondola went directly to the restaurant. Chris Ellms, Director of Ski Operations, said that you would leave the gondola and walk over to the restaurant. Donna Foster seconded and the vote was unanimous. •	The addition is now 68 rooms, not 66. There is no change in the footprint, just the rearranging of rooms or the downsizing of rooms. •	Water is from the existing Rosebrook Water system. Alex Foti asked if they had checked that going from 200 rooms to 268 rooms. Both Don and Josh DeBottis said they are working on this and are very confident that they will be fine. •	There are 3 hydrants and they may be moving one. They are working with Fire Chief Oleson. The Chief also said that the fire access lane looks good. Terry Penner asked if they were going to need a lot of extra help. General Manager, Josh DeBottis said they would be looking at help for the front desk, housekeeping, etc and they are working on foreign help now. Donna Foster asked if there would be access inside to the hotel. The answer was yes but it was only 300 steps from the new addition to the hotel. Alex Foti asked if they had checked about going from 200 rooms to 268 rooms and if the water will be available. Both Don and Josh DeBottis said they are working on this and are very confident that they will be fine. Alex also said that it seems like the homeowners feel left out with additions that are happening and that amenities are being taken away. Fire Chief Jeremy Oleson said the town needs to be ready for all of these things. He feels they are pushing the limit of what they have available to them. It is starting to get very stressful. They need to get volunteers and equipment. Jeremy also said that we need to work together and voters need to do the right thing for the whole town. Bonnie Moroney seconded and the vote to accept as complete was unanimous. The Chair told Don Bouchard that now the process has been that the board will see them in June for a approval of the application. Don said he is asking the board to please review the application now for an approval. He said they would like to get an approval out of the way. Terry Penner did not feel it was urgent to get this approved tonight as they were still waiting on approvals from the State. So he did not feel waiting 30 days was an issue. The Chair asked the secretary if an ad had been put in the Democrat and if abutters had been notified. The answer was yes to both. Bonnie Moroney made a motion to: open the Public Hearing for the Site Plan Application for the Omni Mount Washington Resort/4 Story Addition. Alessandro Foti seconded and the vote to open the Public Hearing was unanimous. Chairman Hogan asked if anyone from the public and any comments or questions. There were no comments or questions. The Chair closed the Public Hearing. •	And to repeat conditions of acceptance to get all State approvals and permits and to continue to work with the Fire Chief in the town. Terry Penner seconded and the motion to approve the application was unanimous. An email from Carol Carlson Cunningham asked the board to again continue her applications. •	Evan said he wanted to change some of the offices that he had at BirchWood Commons to apartments. Chief Oleson said that a 2 hour fire wall will need to be constructed per code. He said that Evan will also need to get 911 numbers for the apartments and they will need a knockout system. Chair Hogan said he didn’t feel that there was a need for an application but that Evan had to get all permits. •	Public Hearing on Regulations—May 8th will be the Public Hearing on the Regulations. Immediately after the board will start on the Zoning Ordinance process. Mike said he would like to meet twice a month. The Fire Chief said he would like to be involved with the Zoning Ordinance. Building Inspector Scalley said he would also like to be involved and he thinks that the ZBA should be invited also. •	The Chair said that several of the board members were able to go to the Spring PLBD & ZBA Conference in Concord on April 25th. He said it was great and that the next conference will be in November. Bonnie Moroney made a motion to: adjourn. Richard Krapf seconded and the motion to adjourn was unanimous. The meeting ended at 9:15.